In honor of the 2008 San Diego Chargers season, and to LT - with all his class and charisma - relax in your plush booth and cheers your top shelf cocktail to DiscoverSD.com's top ten upscale San Diego sports bars. 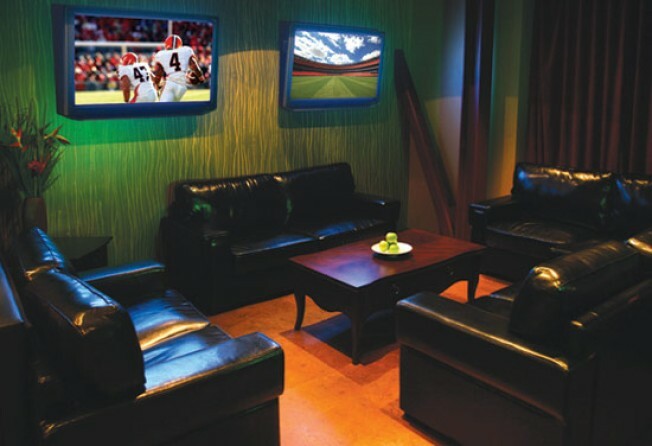 Fine dining by evening, cover-free dancing by night, and the utmost upscale sports bar in San Diego by game day. The Tavern and Bowl features tasty and creative eats from the "Food Dude". On the outskirts of Gaslamp, Yardhouse is overwhelmingly packed with options for all sports fans. Boasting 14,500 square feet of sporty space under thirty-foot ceilings, former San Diego Chargers and Miami Dolphins linebacker Junior Seau knew what he was doing when he hooked up sixty televisions, including a giant twelve by fourteen-foot projection screen, and menu spanning multiple nations at this massive Mission Valley sports bar. The Firehouse American Eatery is a mellow game day venue with indoor and outdoor plasmas in the first floor bar and the upstairs outdoor lounge. For the sports fans that want to keep it classy without losing the downtown experience, head to the Gaslamp Tavern for pitchers and plasmas in the open air, all season long. Expect an improved menu, a local crowd of beach bums turned sports fanatics, and guest DJs and a nightlife vibe come nightfall. The Tilted Kilt has become one of the most popular downtown San Diego sports bars - especially for Padres fans. While most popular for Del Mar Racetrack season, Jimmy O's is a year-round sports bar with a high-end clientele. The new Bare Back Grill in Gaslamp hosts a Monday Night Football party with special guest NFL alumni. For more details about these bars and even more "notable mentions" read the DiscoverSD.com article "Discover Nightlife: Top Ten Upscale San Diego Sports Bars." Leave us a comment with your picks below.